Michele Smith, former left-handed Collegiate All-American & 2-winning Olympian and current Sports Commentator, showcases with Fergie his new 1969 Cubs book in Oklahoma City at the Annual Warren Spahn Dinner. $249 Each autographed by Hall-of-Famers Fergie Jenkins, Lee Smith and Andre Dawson. Additional Inscriptions $10 Each. 2019 UPCOMING - 3G (3 Generation) BASEBALL FUNDAMENTAL/SKILLS CAMPS ACROSS THE COUNTRY....REGULAR UPDATES SOON ! Now both Red and White are bottled and ready for orders. Price is $30 each or 2 for $50 autographed. Add $10 to ship in styrofoam insulated double bottle boxes to any Continental US destination. To order email fergiejenkins@bellnet.ca or call our office directly at 905 688 9418 and ask for Geoff or Don. Payment by CC preferred. US funds. This wine batch is limited to 800 bottles. To purchase any of these items contact our office at pr@fergiejenkins.ca or call (905) 688-9418. 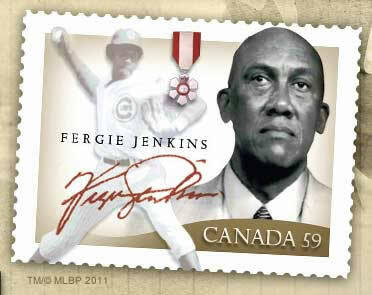 Welcome to the official website of Baseball Hall of Famer and humanitarian, Fergie Jenkins. Here, you will find information regarding Canada's only member of the National Baseball Hall of Fame in Cooperstown, NY, as well as an abundance of information about his registered charity, the Fergie Jenkins Foundation. If you have any questions about the Fergie Jenkins Foundation, don't hesitate to send us a note via the CONTACT header in the top right corner of the website. By navigating through this site, you will learn all about the Fergie Jenkins Foundation and stay up to date on where Fergie and his team will be holding charity events. We welcome your comments, questions and hope that you will assist Fergie in his missions of goodwill. The Fergie Jenkins Foundation was founded in 1997 under the mission statement of "Serving Humanitarian Need Through the Love of Sport." The Foundation supports nearly 400 charities across North America and engages in dozens of annual fundraisers in support of numerous causes.